If you are working in the private sector, or if you are contributing to the Employees Provident Fund (EPF), this would be of interest to you. To all new contributors, nothing has been decided yet; this is just a proposal if it worries you. But personally, I think the withdrawal should be made flexible once a contributor reaches age 55. He/she has been planning all his/her working life for things to 'happen' at 55 so, let him/her have it her way for once. 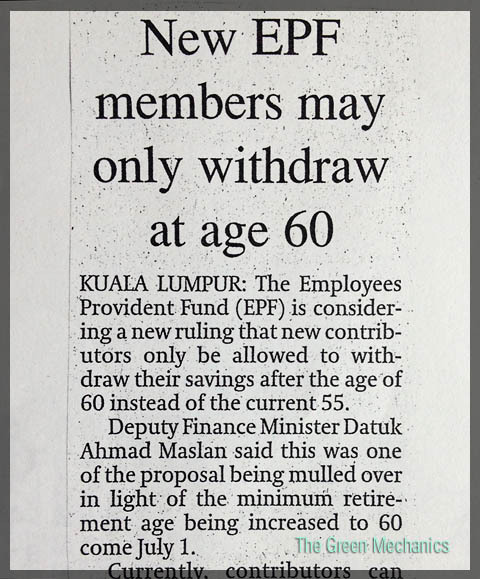 The Employee Provident Fun is considering new ruling that new contributors only be allowed to withdraw their savings after the age of 60 instead of the current 55. Deputy Finance Minister Datuk Ahmad Maslan said this was one of the proposal being mulled over in light of the minimum retirement age being increased to 60 effective July 1. Currently, contributors can still withdraw their EPF savings at 55, either as a lump sum, monthly amounts or a combination of both options. This flexible withdrawal scheme would enable contributors to obtain a fixed and consistent income for a long period amidst worries that their money would be exhausted within few years. "However, no decision has been made on this proposal yet," Ahmad said after a working visit to EFP the day before. EPF chief executive officer Datuk Shahril Ridza Ridzuan said any change would only take place after th EPF Act had been amended. He said members could still contribute to the fund despite the retirement age being extended to 60. So many proposals from the government lately. Sometimes too many half-cooked proposals, too. But to be fair, they are just answering questions from the press.